I have an oddly unironic obsession with playing solitaire. My fancy little PDA-cell phone has a built-in solitaire game, and I play it endlessly on the bus. I used to play online slot games at www.EasyMobileCasino.com but got into solitare when I switched my phone plan to one that didn’t include internet. It’s been a couple of months now that I have been playing on my commute to and from work, keeping a little note with my high scores. Anyway, I’ve found an interesting dynamic with the music that I choose to listen to while I play solitaire. I want it to be upbeat, but not obnoxious. Not background music, per se… more motivational, but not motivational like “Gonna Fly Now.” I’ve found that proper music gives me the best possible solitaire form. Two Gallants may be the best solitaire band currently on my iPod. Them or Radiohead, but there is never really a situation where Radiohead isn’t a good choice, as far as I’m concerned. 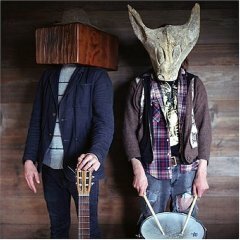 Two Gallants’ self-titled 2007 release, their 3rd full-length and 2nd on Saddle Creek Records, is one of the oddly catchiest albums I’ve heard this year. My initial reaction was neutral, but that lasted all of 2 minutes or so, and then I found myself completely enraptured. The vocals on the album are quite unique, but they’re equally catchy, and add a dimension that’s hard to define, but impossible to miss. I think Two Gallants can probably best be described as folk-pop, but to be entirely honest, I’m awful with labels. I’m not really comfortable giving them, because I always feel like somebody is going to tell me they’re wrong. Irrational? Probably. There is definitely a folksy sound with the guitar and vocals, but I think a folk label alone is too limiting. When it all boils down to it, these are just extremely well-written pop tunes. Taking away any labels, when it’s all boiled down, what’s really here are tight, hooky, well-written pop tunes. The songs on the album vary from slow, acoustic-guitar driven near-ballads (‘Fly Low Carrion Crow” and “Trembling Of The Rose”) to the almost-country folksy sound of “Despite What You’ve Been Told.” To be honest, I can’t really pick a favorite. The whole disc flows relatively seemlessly, and, most importantly, has taken my solitaire scores to a level I never though possible.